A significant number of consumers may have been affected by a recent salmonella outbreak caused by Foster Farm poultry products. According to NBC News, the company, which is the sixth largest chicken vendor in the U.S., has been linked to the outbreak, which could have affected more than 16,000 consumers. Current numbers show that 416 cases of food poisoning were linked to the Foster Farms salmonella outbreak in 2013, and in around 40 percent of those instances, individuals required hospitalization. Salmonella poisoning can cause a variety of adverse symptoms and is most often linked to raw chicken, as in this case. While just over 400 instances were reported, the outbreak affected a number of products at the three plants found to have processed the items. This puts a large number of consumers who have purchased this brand of poultry at risk of foodborne illness. However, a new study found that Foster Farms products weren't the only ones on supermarket shelves to contain dangerous bacteria. According to Consumer Reports, 97 percent of products tested as part of the study were found to harbor bacteria. Additionally, the Center for Disease Control and Prevention told the source that more deaths from food poisoning come from tainted poultry than any other item. For this reason, it is increasingly important to safely store, handle and prepare these foods. Following news of the outbreak, Consumer Reports performed a study that included examination and testing of more than 300 raw chicken breasts purchased at typical grocery stores. Investigators found that nearly all of the samples were contaminated by some form of harmful bacteria, including organic brands. Furthermore, the tests showed that some salmonella strains can be resistant to antibiotics when they cause a person to fall ill. During the study, Consumer Reports found that these samples are most commonly found at local grocery stores. Another study performed by Pew Charitable Trusts found that although the USDA's Food Safety and Inspection Service has taken steps to prevent foodborne illnesses caused by Salmonella poisoning, they need to be doing more. "When more than 500 people get sick from two outbreaks associated with chicken that meets federal safety standards, it is clear that those standards are not effectively protecting public health," Sandra Eskin, Pew Charitable Trusts food safety project director told Food Poisoning Bulletin. The organization advised the FSIS to adjust their performance requirements for poultry vendors to ensure that rules are updated on a regular basis and are enforceable. In addition, standards should be better linked to public health outcomes so consumers are aware of the risks. Food Poisoning Bulletin also stated that the FSIS should consider creating limits to govern salmonella contamination of chickens coming into slaughterhouses to lessen instances of outbreaks. The FSIS should perform unannounced tests of products at processing plants to identify potential Salmonella contamination before it affects consumers. Additionally, facilities that are under investigation for releasing unsafe foods should be closed, recommended Pew. In order to adequately protect consumers, those within the foodservice industry should be sure to follow guidelines for safe storage and preparation of poultry. 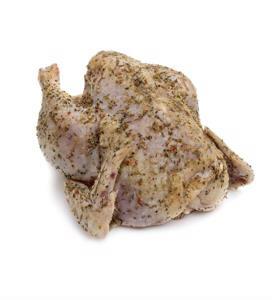 According to Culinary Arts, chicken products should be kept refrigerated at 40 degrees Fahrenheit or below. To maintain the proper level, restaurants and vendors can utilize a temperature monitoring system. This technology ensures that storage units are kept within the best range and products are fresh. When stored at the proper level, bacteria is less likely to grow. Chicken products should also be thawed carefully to prevent bacterial growth. Poultry should never be defrosted at room temperature, and should be allowed to thaw in the refrigerator for up to two days. Furthermore, poultry should be cooked until its internal temperature goes above 140 degrees Fahrenheit. This ensures that it is completely cooked and any bacteria from raw products are killed.